The large flowering trees of South Florida provide shade and outstanding beauty for larger landscapes. Large house and plenty of room - large tree. Two story house and a good-size yard - large tree. Tiny cottage or mobile home - forget the large tree. 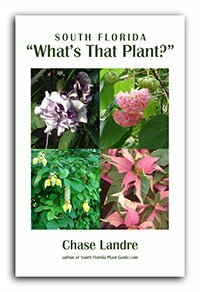 Stick with a small flowering tree that grows 20 feet or less. A tree should complement your home...not overwhelm it. But what if you fall in love with a big tree variety and only have an average-size yard? Perhaps your tree can be kept in line with trimming...or use it as a single yard specimen. Some tabebuias are terrific trees of 20 to 30 feet that can work for you. Some trees will get very wide as well as tall - make sure you have the space to handle it. As with all big trees, plant well away from your house, approximately half the width of your tree's mature canopy. 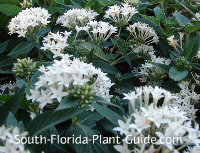 The Plant Pages on individual varieties will help you with spacing info. Remember the view from indoors...some years down the road your golf course or water view may be obstructed by a big tree trunk. If you plant too close to the end of the driveway you may not be able to get a clear view of the street around the trunk and/or lower branches of a mature tree. Consider power lines when you choose the placement of a big tree. If the power company trims your tree, it won't be pretty. A common landscaping mistake: Planting a big tree in the middle of your yard visually cuts your house in half and makes it seem smaller. Interesting trunk colors, shapes and textures. Tree trunks are landscape elements too and are more noticeable on bigger specimens. Example: the floss silk's giant medieval spikes. Wind tolerance can be an issue with larger trees, especially when strong summer storms fling your flowers away. Fast growers also have less dense wood which means limbs may be more prone to breakage than those of a slower growing tree. Some large flowering trees have fragrance, too - D.D. Blanchard magnolia, one of the most beautiful southern trees, has flowers with the strongest fragrance in nature. And the ylang ylang tree's flowers are used in perfumes. Trees are generally the lowest maintenance plant of all - except for falling blossoms (and some leaf drop even on non-deciduous trees of Florida). If you think flower petals on the ground are messy, don't plant a flowering tree. Placement may solve the issue for you. Flowers on the lawn can be picturesque - but on the drive or walk? Not so much. Some South Florida trees are deciduous - they lose their leaves in winter - but the payoff in warmer weather is worth it. The tabebuia ipe is one of the first trees to burst into bloom in early spring, before its leaves begin to show. If you're a Snowbird, Hong Kong orchid flowers all winter long. 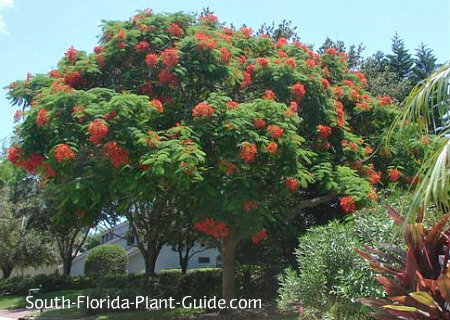 If you have a really large property, plant look-alikes royal poinciana, jacaranda and peltophorum...you'll get a succession of stunning spring purple, summer red and early fall yellow blossoms.